Our LED Jargon Buster and LED FAQs complement this article. Check these if you are unsure about terminology. 1. Not all LEDs are made equal, whereas all old incandescent lamps were fundamentally alike. Not all LED lights or drivers are made to be dimmable. This is because dimming LEDs requires additional electronic components which add cost. If you’ve purchased a standard, low-priced, LED the chances are it is cheaper because it does not dim. So the most fundamental point of this article is: Make sure you check the light you’re buying is marked as ‘dimmable’. At the same time, even if two lamps are both ‘dimmable’, their dimming performance may not be the same. This is because the quality of the electronics can vary and, like many things, you often get what you pay for. All dimmer units have a maximum amount of power they can regulate. A typical value for traditional dimmers is 400W. A 400W dimmer could run up to 6 x 60W incandescent lamps (360W). You would assume that the same 400W dimmer can run up to 40 x 10W LED lamps, but this is not true. Due to a phenomenon known as in-rush, for a very short period of time LED lamps draw a large amount of current. This does not affect the average amount of current drawn very much, so LEDs are big energy-savers, but it does mean that a dimmer will “see” them as having a higher wattage. Because of this, some manufacturers recommend that you only use up to 10% of the dimmer’s maximum capacity. In which case, those manufacturers would recommend no more than 4 x 10W LED lamps on a 400W dimming unit. While manufacturers who recommend 10% are not exaggerating, they are quoting a figure they know will always work. In practice, sticking to the 10% figure is not an absolute necessity though you would be well advised to never go greater than 25% of the dimmer maximum. To do so would run the risk of overloading the dimmer and damaging both the it and the lamps. Old rotary dimmers were designed in a time when incandescent lamps were the only option for household lighting. As a result, dimmer designers made them to operate by stealing a small amount of the power sent to the lamp. The effect of this is that old dimmers won’t work with LEDs as the dimmer does not have enough to steal. For example, a traditional 400W dimmer might have a minimum wattage of 30W. If you were to put 1 x 10W LED on this dimmer, it would behave very erratically or not work at all. If you used 4 x 10W LEDs, they would probably work as there is enough load. However, if you tried to dim them below 30W in total you would get erratic behaviour again. 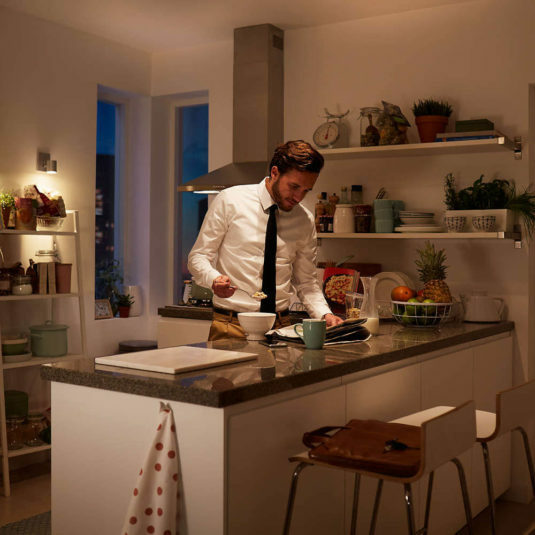 Modern rotary dimmers, which have a dial you twist to dim or increase the light intensity, with no minimum wattage overcome this problem by incorporating a neutral wire that allows the dimmer to draw power even when the light is not on. The dimmer’s constant source of power means it is capable of dimming LEDs very low without failing. All these complications mean dimming performance will vary with different combinations of equipment. Changing a lamp, changing a dimmer, changing a driver, adding more lamps, and removing lamps can all affect the performance of a dimming system. The best way to ensure to achieve the result you want is to check that all the components you are using are compatible with each other in the way you intend to use them. Lamp and dimmer manufacturers often provide extensive lists of what will work with what. Where these are available, SaveMoneyCutCarbon make them available to you. Where they are currently unavailable, we will endeavour to get combinations tested by our suppliers. You should be wary of compatibility, but let us do the leg work. How much do you want to dim your lamp? You may not have thought about it before, but asking how much you need your lamp to dim is an important question. People have become accustomed to standard incandescent dimming but there is now greater opportunity to refine your lighting choice. Light dimming is measured in percentages. The lowest dimming value is 1% of maximum light intensity. Few people will require this. Dimming fluidly down to 1% of output requires advanced electronics and this comes at a price. In order to change the atmosphere in your lounge, dimming down to 10% would be suitable and would come at a more reasonable price. Only more specialist environments will demand lower percentages. Finally, be aware that visible dimming is slightly different to measured dimming. This is because the eye is more adept to changes in light intensity at low brightness. It takes quite large drops in intensity for the human eye to notice dimming at high brightness. This means you are likely to notice a difference from 7% to 5% but are very unlikely to notice the difference from 97% to 95%. The lesson from this is that a lamp can be ‘dimmable’ because it can be measured as dimming by a lux meter, but this dimming is not visible. However, lamps marked as dimmable are almost always dimmable in a way which is visible.